It’s not uncommon for a builder to get into the retail side of the LBM industry. It’s a natural fit for a person already geared toward the trades and looking for a career that may be less physically taxing. 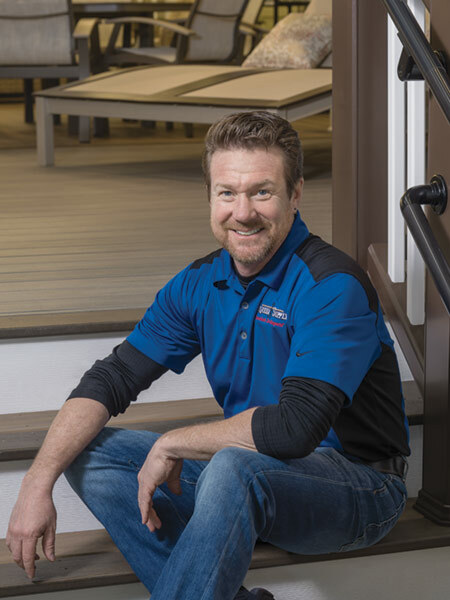 For John Keller, owner of Sequoia Out Back, the shift from building decks to selling deck supplies came more out of a need for the right product and pricing. As the preeminent deck builder in his area, Keller reached a point at which he needed to purchase lumber from wholesalers. To do so, he formed a company to resell the product to himself as a builder. Word soon spread to other deck builders and homeowners that Keller knew good lumber when he saw it, and was able to source it for a good price. Within five years, the lumber company begame bigger than the construction company. 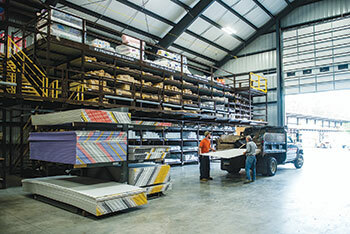 Keller’s early entry into the composites market helped build a solid foundation to his decking sales success. Early on in his retail career he sold primarily cedar and treated decking, but Keller was quick to recognize the versatility and value of composite products. By the time consumer awareness of composites caught up, Keller had already established himself as a product expert. Now in his 22nd year of retail sales, Keller has built upon the decking foundation by integrating outdoor living items into his product mix. In 2008, the company went big into the outdoor living market. Today, Sequoia Out Back is not only known for decks, but for deck furniture, grills and accessory items, fire pits, and outdoor kitchens as well. Sequoia Out Back’s main location features four levels of decks throughout a facility on a 10-acre property that includes a 30,000 square-foot warehouse. Sequoia Out Back’s main location features four levels of decks throughout a facility on a 10-acre property that includes a 30,000 square-foot warehouse. 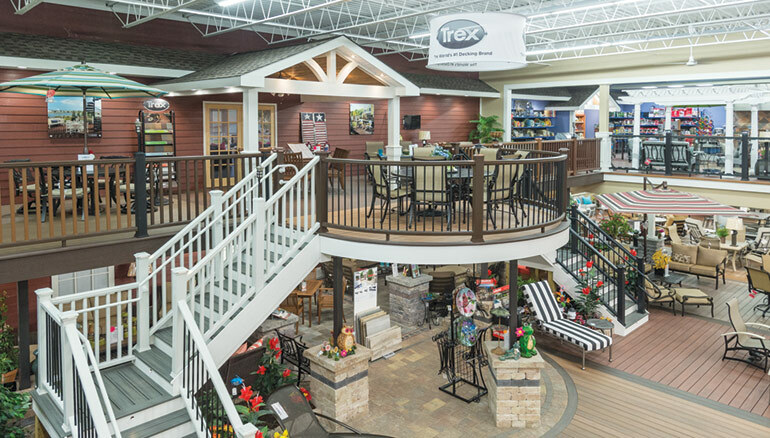 Each floor in the store is done with decking and railing and the entire store is designed to give customers the experience of walking on decking products that are readily available for sale. In a sense, the whole store is a display. “Everything looks like a deck or a patio,” Keller says. 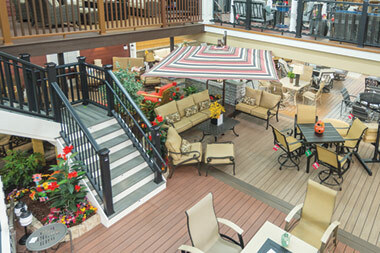 Atop the decking on the floors sits all of the casual and outdoor living products that are also available for sale. Most everything throughout the store, from decks, rails, columns, and trim to accessories is sold through the showroom, including the tongue-and-groove ceiling. Another satellite showroom in nearby Warrington features many of the same products, and Keller hopes to build it out to be a smaller version of the main Hatfield store. 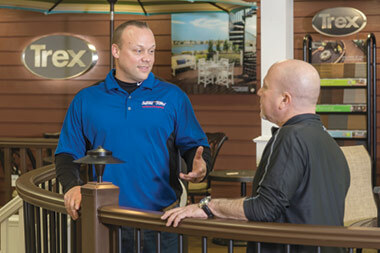 While serving primarily a 70% contractor customer base, Keller says that doesn’t mean his store mostly sees contractors coming through the door. Primarily, homeowners are sent there by their contractors so they can experience the decking and outdoor products hands-on. Other times, homeowners come in the store specifically to get ideas and ask for connections to local deck builders. With 25 employees during the seasonably high summer months, Keller says he’s continuing to grow his decking business and is looking forward to expanding his satellite location in Warrington. Business passed pre-Great Recession levels in 2013, and Keller says the company has been growing a steady 10% to 15% year-over-year since. 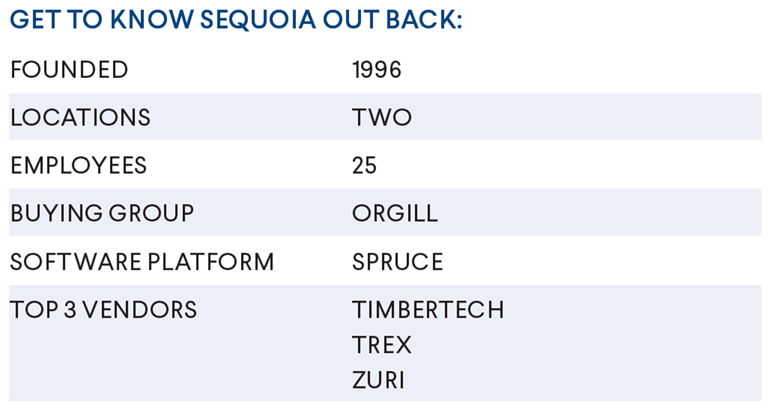 Even during the worst parts of the recession, Sequoia Out Back was able to maintain a flat level of sales. Keller is the sole owner of the business, and says he sees the company’s success continuing long into the future. As long as he can manage labor needs and make good calls on inventory, he’ll continue to focus on what has made Sequoia Out Back a success. “The amount of money people are spending in their back yards is now more than it’s ever been,” he says. With that trend expected to continue, Keller is focused on featuring various outdoor furniture displays from low-mid, and up to high-cost.